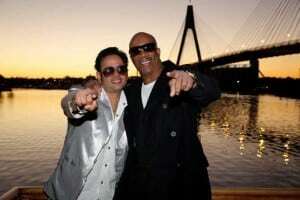 The Rhythmboat Sydney Harbour is well known throughout Sydney as the BEST party venue afloat. With capacity for up to 150 guests and a highly experienced crew, bar and catering staff the Party Boat is ready willing and able to ensure that your special event will be one to remember. Cruising Sydney Harbour aboard the Party Boat with your friends, clients, distinguished guests ensures that your special function has the world’s most beautiful harbor as a backdrop. Day or night Sydney Harbour is breathtaking and there is never a dull moment. The Sydney Harbour Bridge, the Opera House, the finger wharfs, Fort Denison, the list goes on and on. With many hundreds of successful functions to our credit the captain, crew and catering staff of the Rhythmboat are experts in providing a first class service and venue for virtually any occasion you can name. Our price can include gourmet finger food, upstairs and downstairs DJ’s playing your favourite music. Drinks are available at our fully licensed and well stocked bar at competitive prices. Contact us on 1300 551 804 for more information.